LPS Micro-X NU Fast Evaporating Contact Cleaner Formulated for utility applications. Full strength degreaser for oil and grease. Does not contain chlorinated solvents. Flash point above 140 deg F. Use on cable splices, terminations, coils, motors, transformers, truck booms, turbines. Non flammable contact cleaner. Fast evaporating, No residue, Does not contain HCFC's, formulated for all 50 states, NSF certified. 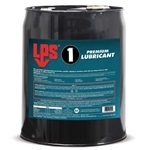 LPS P/N 428-00720 Excellent all purpose lubricant for cables, gears, chains, etc. Leaves non drying light oily film for protection. High flash point (160 deg F).